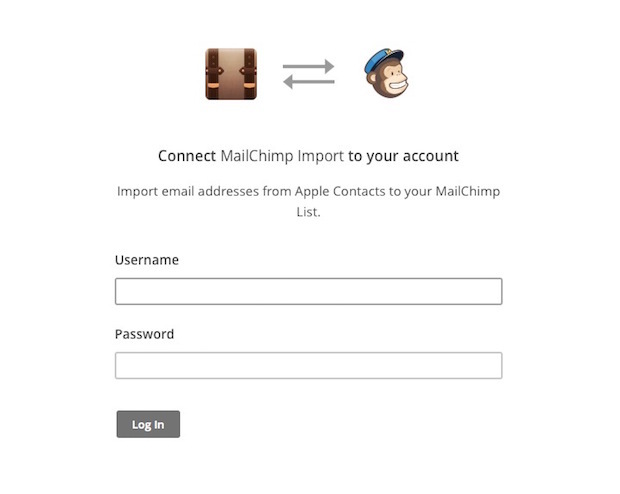 Mailchimp Import is an OSX application that exports addresses from your Mac Address Book into your Mailchimp account, including addresses pulled from Google Contacts and other outside sources. The app exports the first name, last name, and email address fields. In this article, you'll learn how to set up Mailchimp Import and how to use it to export addresses to your Mailchimp account. To set up Mailchimp Import, follow these steps. Download Mailchimp Import from the App Store. Open the Mailchimp Import app. On the Permission Notification pop-up, click Continue to agree and import only permission-based lists. On the "Mailchimp Import" would like to access your contacts pop-up, click OK to grant us permission to access your Mac Contacts. On the Connect to Mailchimp screen, fill in your Mailchimp login credentials, then click Log In. After you've connected the Mailchimp Import app to your Mailchimp account, you'll export your contacts. To export your contacts to Mailchimp, follow these steps. Use the drop-down menu in the top-right corner to select the list you'd like to export to. Click to select the contacts you want to export, then drag and drop them into the right column that says Drop Contacts Here. When you're finished adding contacts, check the Yes, these contacts have opted-in permission confirmation box. In the confirmation pop-up, click Yes, Import. When your contacts have exported to your Mailchimp account, we'll display a confirmation pop-up. Click Done to close the pop-up and return to Mailchimp Import. Click Details to view the results of your import. This displays the contacts you imported to your Mailchimp list, and lets you see if contacts failed to import and why. If Mailchimp Import isn't compatible with your version of OSX, export your contacts as a vCard file and use a program to convert the file to a CSV or TXT file. 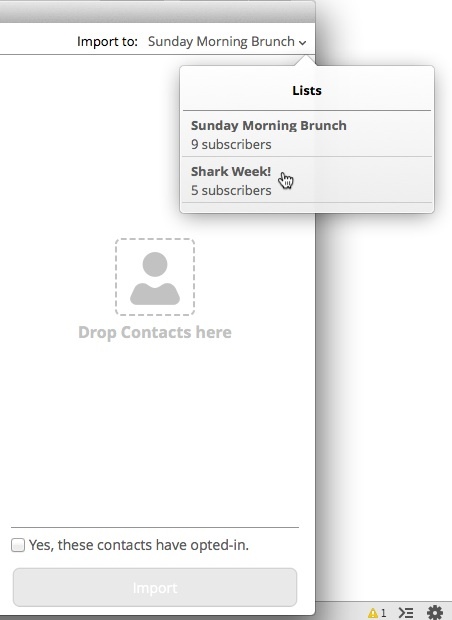 After you've converted your file, import your contacts to your list. Learn how to export contacts from a few common applications. Learn about ways to avoid accidentally importing people who didn't opt-in to your list.